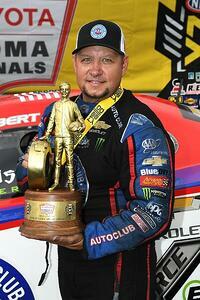 SONOMA, Calif. (July 29, 2018) — Robert Hight and the Auto Club of Southern California Chevrolet Camaro SS team raced their way to victory Sunday at the Toyota NHRA Sonoma Nationals in front of a sold-out crowd. Hight led the John Force Racing effort with John Force having a semifinal finish, Brittany Force making a second-round exit and Courtney Force having an early race day with a first round exit. In the final, Hight, the reigning world champion, faced a familiar foe of John Force Racing, Ron Capps, the 2016 world champion. Hight had the better car with a 3.984-second pass at 319.75 mph that out did Capps’ 4.077 pass at 296.11 mph despite Capps having the better reaction time. Hight is now 34-31 against Capps including being 6-2 over him in final round meetings. Hight has faced Capps more often than any other driver in his career, including his boss John Force who he has faced 44 times. A week after earning his 149th career victory, John Force took the PEAK Coolant and Motor Oil Chevrolet Camaro SS back to the semifinal round Sunday before dropping a close decision to Ron Capps. Force had a starting line advantage but his 4.081 second run wasn’t quite good enough to match Capps and his 4.000. 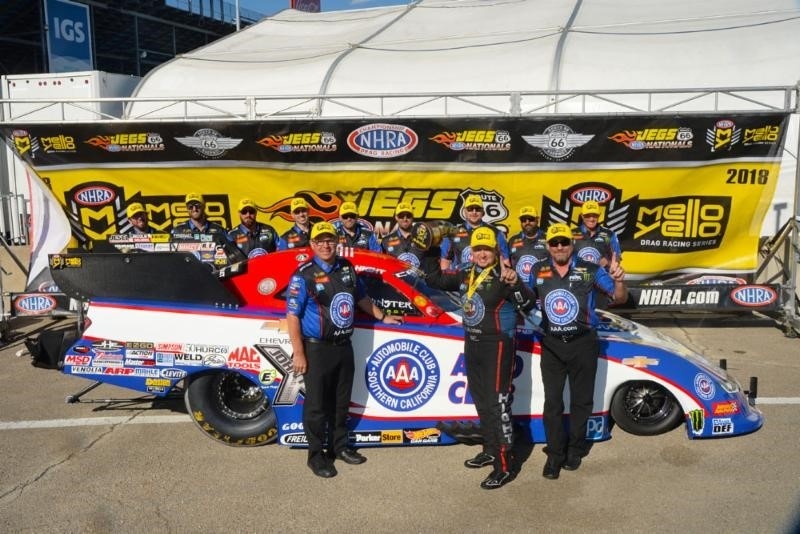 Nevertheless, Sunday’s success enabled the 16-time Funny Car champion to put more distance between himself and those with whom he contending for a berth in the upcoming Countdown to the Championship. In the first round, Force made his way around Shawn Langdon on a holeshot with his 4.026-second pass combined with a .040 reaction time bettering Langdon’s 4.000-second pass with a .073 reaction time. Second round, Force took out veteran Del Worsham, who had upset No. 1 qualifier Courtney Force in round 1. John put up a 4.069 second run to drive past Worsham’s 4.080. To open race day, Brittany Force and her PEAK Coolant and Motor Oil Monster Energy dragster took a win from Richie Crampton when they laid down a 3.759-second pass at 329.91 mph bettering his 3.766 pass at 325.14. Despite the quality run, Force heeded lane choice in round two to eight-time world champion Tony Schumacher and suffered a hole out at the start and hazed the tires down track to put up 4.985-seconds at 144.77 mph. Schumacher to drove around Force with only a 4.375-second pass after he blew up in the lights. Despite losing second round, making it out of the first round hasn’t been a guarantee for the Top Fuel world champion so heads are high as they head to the next race. “We’ve been really struggling in the first round, but today we went right down there,” Force said. “It was a beautiful run and then, you know, we struggled in the second round (against Tony Schumacher). The thing is, we have to take these small victories when they come and just try to get ready for the Countdown. We’ve got three races left and we still have a lot to figure out on this car but I know this PEAK Coolant and Motor Oil Monster Energy team will be ready for it." It was an uncharacteristically short race day for Funny Car points leader Courtney Force. After qualifying No. 1 off a stout 3.910-second pass at 326.16 mph on Friday night, which remained quickest and fastest of the weekend, Force and her Advance Auto Parts Chevrolet Camaro SS ran 4.091 seconds at 300.00 mph with a hole out in the first round. They were outperformed by veteran Del Worsham who had a 3.983-second pass at 325.22 mph. “I definitely had my hands full on that run. It dropped a cylinder. I tried to hold it off the center line as best I could and stay in the throttle to see if we hopefully could get around him but (Worsham) had a great run. I think it was the best he had all weekend and we weren’t there to be able to pass him,” Force said. NHRA Mello Yello Drag Racing continues at the CatSpot NHRA Northwest Nationals, the final race of the Western Swing, at Pacific Raceways August 3-5.